Compatible with a range of play and crafting resources, opt for our Plastic Paint or Sand Scrapers. 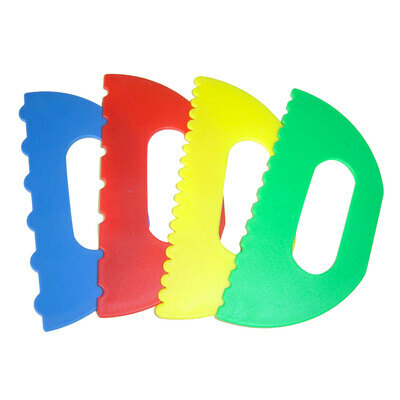 Supplied in a set of 4, each one has been manufactured from durable plastic and finished in a bold colour. Large and easy-to-grip handles make them suited to younger children with a smooth surface that is easily wiped clean in minutes after use. Each one has a different patterned edge, encouraging children to experiment with their creativity and discover a new way of crafting. Alongside these paint and sand scrapers, we also stock a range of items from our 12 Block Watercolour Paint Set through to Plastic Modelling Tools and corresponding Modelling Boards - all for exceptional wholesale prices.